SYSA musicians and their families can subscribe to the SYS Google Calendar HERE. This page is password protected. Tuition due dates: See the Auditions page. If 4 installments, Oct. 15, Nov. 15, Feb. 15, March 15. We use an online Volunteer Log to keep track of the many hours that our families donate to support our orchestras. SYS is now using SignUp.com to post and fill volunteer positions. You can use the online Absence form if you have a conflict. See summer camps for the latest information on summer camps. Salem Youth Symphony provides four levels of orchestral experience geared for youth throughout age twenty-one. MOZART PLAYERS: A non-audition early level string ensemble. AMADEUS PLAYERS: A mid-level string ensemble. PHILHARMONIA: A full symphony orchestra. YOUTH SYMPHONY: The advanced full symphony orchestra. Visit the Auditions page to learn more about joining SYS. Salem Youth Symphony, in support of public and private school music programs, requires students to be enrolled in a musical ensemble offered at their school for their instrument. 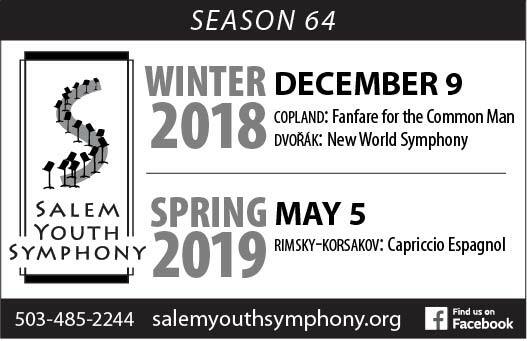 The Salem Youth Symphony Association is a 501(c)(3) non-profit organization that offers an exceptional musical experience to dedicated young musicians through 21 years old from Salem-Keizer and the surrounding communities. During the 2016-2017 season we have just over 200 musicians from 40 different schools in various communities. Quality of musicianship and attention to detail are stressed in the weekly rehearsals, culminating in concerts in which the joy of performing music of the great composers is shared with the audience. Salem For All! Discount- 18 and over with the Oregon Trail card- $5.00 each , two per person.